Magnetic resonance imaging (MRI) is one of the newest diagnostic medical imaging technologies that uses strong magnets and pulses of radio waves to manipulate the natural magnetic properties in the body to generate a visible image. In the field of mental health, an MRI scan may be used when a patient seeks medical help for symptoms that could possibly be caused by a brain tumor. These symptoms may include headaches, emotional abnormalities, or intellectual or memory problems. In these cases, an MRI scan may be performed to "rule out" a tumor, so that other tests can be performed in order to establish an accurate diagnosis . MRI was developed in the 1980s. Its technology has been developed for use in magnetic resonance angiography (MRA), magnetic resonance spectroscopy (MRS), and, more recently, magnetic resonance cholangiopancreatography (MRCP). MRA was developed to study blood flow, whereas MRS can identify the chemical composition of diseased tissue and produce color images of brain function. MRCP is evolving into a non-invasive potential alternative for the diagnostic procedure endoscopic retrograde cholangiopancreatography (ERCP). DETAIL. MRI creates precise images of the body based on the varying proportions of magnetic elements in different tissues. Very minor fluctuations in chemical composition can be determined. MRI images have greater natural contrast than standard x rays, computed tomography scan (CT scan), or ultrasound, all of which depend on the differing physical properties of tissues. This sensitivity allows MRI to distinguish fine variations in tissues deep within the body. It is also particularly useful for spotting and distinguishing diseased tissues (tumors and other lesions) early in their development. Often, doctors prescribe an MRI scan to investigate more fully earlier findings of other imaging techniques. SCOPE. The entire body can be scanned, from head to toe and from the skin to the deepest recesses of the brain. Moreover, MRI scans are not obstructed by bone, gas, or body waste, which can hinder other imaging techniques. (Although the scans can be degraded by motion such as breathing, heartbeat, and bowel activity.) The MRI process produces cross-sectional images of the body that are as sharp in the middle as on the edges, even of the brain through the skull. A close series of these twodimensional images can provide a three-dimensional view of the targeted area. Along with images from the cross-sectional plane, the MRI can also provide images sagitally (from one side of the body to the other, from left to right for example), allowing for a better three-dimensional interpretation, which is sometimes very important for planning a surgical approach. SAFETY. MRI does not depend on potentially harmful ionizing radiation, as do standard x ray and computed tomography scans. There are no known risks specific to the procedure, other than for people who might have metal objects in their bodies. Despite its many advantages, MRI is not routinely used because it is a somewhat complex and costly procedure. MRI requires large, expensive, and complicated equipment, a highly trained operator, and a doctor specializing in radiology. Generally, MRI is prescribed only when serious symptoms or negative results from other tests indicate a need. Many times another test is appropriate for the type of diagnosis needed. Doctors may prescribe an MRI scan of different areas of the body. BRAIN AND HEAD. MRI technology was developed because of the need for brain imaging. It is one of the few imaging tools that can see through bone (the skull) and deliver high-quality pictures of the brain's delicate soft tissue structures. MRI may be needed for patients with symptoms of a brain tumor, stroke , or infection (like meningitis). MRI may also be needed when cognitive or psychological symptoms suggest brain disease (like Alzheimer's or Huntington's diseases, or multiple sclerosis), or when developmental retardation suggests a birth defect. 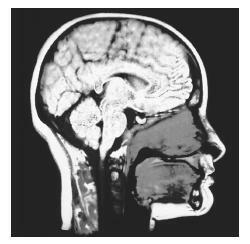 MRI can also provide pictures of the sinuses and other areas of the head beneath the face. In adult and pediatric patients, MRI may be better able to detect abnormalities than compared to computed tomography scanning. SPINE. Spinal problems can create a host of seemingly unrelated symptoms. MRI is particularly useful for identifying and evaluating degenerated or herniated spinal discs. It can also be used to determine the condition of nerve tissue within the spinal cord. JOINT. MRI scanning is most commonly used to diagnose and assess joint problems. MRI can provide clear images of the bone, cartilage, ligament, and tendon that comprise a joint. MRI can be used to diagnose joint injuries due to sports, advancing age, or arthritis. MRI can also be used to diagnose shoulder problems, such as a torn rotator cuff. MRI can also detect the presence of an otherwise hidden tumor or infection in a joint, and can be used to diagnose the nature of developmental joint abnormalities in children. SKELETON. The properties of MRI that allow it to see through the skull also allow it to view the inside of bones. Accordingly, it can be used to detect bone cancer, inspect the marrow for leukemia and other diseases, assess bone loss (osteoporosis), and examine complex fractures. HEART AND CIRCULATION. MRI technology can be used to evaluate the circulatory system. The heart and blood flow provides a good natural contrast medium that allows structures of the heart to be clearly distinguished. THE REST OF THE BODY. Whereas computed tomography and ultrasound scans satisfy most chest, abdominal, and general body imaging needs, MRI may be needed in certain circumstances to provide better pictures or when repeated scanning is required. The progress of some therapies, like liver cancer therapy, needs to be monitored, and the effect of repeated x-ray exposure is a concern. MRI scanning should not be used when there is the potential for an interaction between the strong MRI magnet and metal objects that might be embedded in a patient's body. The force of magnetic attraction on certain types of metal objects (including surgical steel) could move them within the body and cause serious injury. Metal may be embedded in a person's body for several reasons. MEDICAL. People with implanted cardiac pacemakers, metal aneurysm clips, or who have broken bones repaired with metal pins, screws, rods, or plates must tell their radiologist prior to having an MRI scan. In some cases (like a metal rod in a reconstructed leg), the difficulty may be overcome. INJURY. Patients must tell their doctor if they have bullet fragments or other metal pieces in their body from old wounds. The suspected presence of metal, whether from an old or recent wound, should be confirmed before scanning. OCCUPATIONAL. People with significant work exposure to metal particles (working with a metal grinder, for example) should discuss this with their doctor and radiologist. The patient may need prescan testing—usually a single, regular x ray of the eyes to see if any metal is present. Chemical agents designed to improve the picture or allow for the imaging of blood or other fluid flow during MRA may be injected. In rare cases, patients may be allergic to, or intolerant of, these agents, and these patients should not receive them. If these chemical agents are to be used, patients should discuss any concerns they have with their doctor and radiologist. The potential side effects of magnetic and electric fields on human health remain a source of debate. In particular, the possible effects on an unborn baby are not well known. Any woman who is, or may be, pregnant, should carefully discuss this issue with her doctor and radiologist before undergoing a scan. As with all medical imaging techniques, obesity greatly interferes with the quality of MRI. In essence, MRI produces a map of hydrogen distribution in the body. Hydrogen is the simplest element known, the most abundant in biological tissue, and one that can be magnetized. It will align itself within a strong magnetic field, like the needle of a compass. The earth's magnetic field is not strong enough to keep a person's hydrogen atoms pointing in the same direction, but the superconducting magnet of an MRI machine can. This comprises the magnetic part of MRI. Once a patient's hydrogen atoms have been aligned in the magnet, pulses of very specific radio wave frequencies are used to knock them back out of alignment. The hydrogen atoms alternately absorb and emit radio wave energy, vibrating back and forth between their resting (magnetized) state and their agitated (radio pulse) state. This comprises the resonance part of MRI. The MRI equipment records the duration, strength, and source location of the signals emitted by the atoms as they relax and translates the data into an image on a television monitor. The state of hydrogen in diseased tissue differs from healthy tissue of the same type, making MRI particularly good at identifying tumors and other lesions. MRI scan of human brain. See color insert for color version of photo. In some cases, chemical agents such as gadolinium can be injected to improve the contrast between healthy and diseased tissue. A single MRI exposure produces a two-dimensional image of a slice through the entire target area. A series of these image slices closely spaced (usually less than half an inch) makes a virtual three-dimensional view of the area. Regardless of the exact type of MRI planned, or area of the body targeted, the procedure involved is basically the same. In a special MRI suite, the patient lies down on a narrow table and is made as comfortable as possible. Transmitters are positioned on the body and the table moves into a long tube that houses the magnet. The tube is as long as an average adult lying down, and is open at both ends. Once the area to be examined has been properly positioned, a radio pulse is applied. Then a twodimensional image corresponding to one slice through the area is made. The table then moves a fraction of an inch and the next image is made. Each image exposure takes several seconds and the entire exam will last anywhere from 30 to 90 minutes. During this time, the patient must remain still as movement can distort the pictures produced. Depending on the area to be imaged, the radio-wave transmitters will be positioned in different locations. • For the head and neck, a helmet-like covering is worn on the head. • For the spine, chest, and abdomen, the patient will be lying on the transmitters. • For the knee, shoulder, or other joint, the transmitters will be applied directly to the joint. Additional probes will monitor vital signs (like pulse, respiration, etc.) throughout the test. The procedure is somewhat noisy and can feel confining to many patients. As the patient moves through the tube, the patient hears a thumping sound. Sometimes, music is supplied via earphones to drown out the noise. Some patients may become anxious or feel claustrophobic while in the small, enclosed tube. Patients may be reassured to know that throughout the study, they can communicate with medical personnel through an intercom-like system. Recently, open MRIs have become available. Instead of a tube open only at the ends, an open MRI also has opening at the sides. Open MRIs are preferable for patients who have a fear of closed spaces and become anxious in traditional MRI machines. Open MRIs can also better accommodate obese patients, and allow parents to accompany their children during testing. If the chest or abdomen is to be imaged, the patient will be asked to hold his to her breath as each exposure is made. Other instructions may be given to the patient as needed. In many cases, the entire examination will be performed by an MRI operator who is not a doctor. However, the supervising radiologist should be available to consult as necessary during the exam, and will view and interpret the results sometime later. Magnetic resonance spectroscopy (MRS) is different from MRI because MRS uses a continuous band of radio wave frequencies to excite hydrogen atoms in a variety of chemical compounds other than water. These compounds absorb and emit radio energy at characteristic frequencies, or spectra, which can be used to identify them. Generally, a color image is created by assigning a color to each distinctive spectral emission. This comprises the spectroscopy part of MRS. MRS is still experimental and is available only in a few research centers. Doctors primarily use MRS to study the brain and disorders like epilepsy, Alzheimer's disease , brain tumors, and the effects of drugs on brain growth and metabolism. The technique is also useful in evaluating metabolic disorders of the muscles and nervous system. Magnetic resonance angiography (MRA) is another variation on standard MRI. MRA, like other types of angiography, looks specifically at fluid flow within the blood (vascular) system, but does so without the injection of dyes or radioactive tracers. Standard MRI cannot make a good picture of flowing blood, but MRA uses specific radio pulse sequences to capture usable signals. The technique is generally used in combination with MRI to obtain images that show both vascular structure and flow within the brain and head in cases of stroke, or when a blood clot or aneurysm is suspected. MRI technology is also being applied in the evaluation of the pancreatic and biliary ducts in a new study called magnetic resonance cholangiopancreatography (MRCP). MRCP produces images similar to that of endoscopic retrograde cholangiopancreatography (ERCP), but in a non-invasive manner. Because MRCP is new and still very expensive, it is not readily available in most hospitals and imaging centers. In some cases (such as for MRI brain scanning or MRA), a chemical designed to increase image contrast may be given immediately before the exam. If a patient suffers from anxiety or claustrophobia, drugs may be given to help the patient relax. The patient must remove all metal objects (watches, jewelry, eye glasses, hair clips, etc.). Any magnetized objects (like credit and bank machine cards, audio tapes, etc.) should be kept far away from the MRI equipment because they can be erased. The patient cannot bring any personal items such as a wallet or keys into the MRI machine. The patient may be asked to wear clothing without metal snaps, buckles, or zippers, unless a medical gown is worn during the procedure. The patient may be asked not to use hair spray, hair gel, or cosmetics that could interfere with the scan. No aftercare is necessary, unless the patient received medication or had a reaction to a contrast agent. Normally, patients can immediately return to their daily activities. If the exam reveals a serious condition that requires more testing or treatment, appropriate information and counseling will be needed. MRI poses no known health risks to the patient and produces no physical side effects. Again, the potential effects of MRI on an unborn baby are not well known. Any woman who is, or may be, pregnant, should carefully discuss this issue with her doctor and radiologist before undergoing a scan. A normal MRI, MRA, MRS, or MRCP result is one that shows the patient's physical condition to fall within normal ranges for the target area scanned. Generally, MRI is prescribed only when serious symptoms or negative results from other tests indicate a need. There often exists strong evidence of a condition that the scan is designed to detect and assess. Thus, the results will often be abnormal, confirming the earlier diagnosis. At that point, further testing and appropriate medical treatment is needed. For example, if the MRI indicates the presence of a brain tumor, an MRS may be prescribed to determine the type of tumor so that aggressive treatment can begin immediately without the need for a surgical biospy. Faulkner, William H. Tech's Guide to MRI: Basic Physics, Instrumentation and Quality Control. Malden: Blackwell Science, 2001. Fischbach, F. T. A Manual of Laboratory and Diagnostic Tests. 6th Edition. Philadelphia: Lippincott, 1999. Goldman, L., and Claude Bennett, eds. Cecil Textbook of Medicine. 21st Edition. Philadelphia: W. B. Saunders, 2000: pp 977–970. Kevles, Bettyann Holtzmann. Naked to the Bone: Medical Imaging in the Twentieth Century. New Brunswick, NJ: Rutgers University Press, 1997. Roth, Carolyn K. Tech's Guide to MRI: Imaging Procedures, Patient Care and Safety. Malden: Blackwell Science,2001. Zaret, Barry L., and others, eds. The Patient's Guide to Medical Tests. Boston: Houghton Mifflin Company,1997. Carr-Locke, D., and others, "Technology Status Evaluation: Magnetic Resonance Cholangiopancreatography." Gastrointestinal Endoscopy (June 1999): 858–61. American College of Radiology. 1891 Preston White Drive, Reston, VA 22091. (800) ACR-LINE. <http://www.acr.org> . American Society of Radiologic Technologists. 15000 Central Avenue SE, Albuquerque, NM 87123–3917. (505) 298–4500. <http://www.asrt.org> . Kurt Richard Sternlof Laith Farid Gulli, M.D.